Richard Lawrence's new book is a modern introduction to the Aetherius Society, and the channelled messages received by its founder, Dr George King. It aims to provide a positive message about UFOs and extraterrestrial visitors to Earth. Written in an intelligent and thought-provoking manner, the book looks at the whole UFO phenomenon from a spiritual, almost quasi-religious point of view. The author divides the UFO community into two halves: 'nuts-and-bolts ufologists', and believers who have a more spiritual point of view. As someone in the former camp, I read the book with a fairly sceptical frame of mind. However, I'm not convinced of the need to polarise the debate in this way. As in all bodies of enquiry, there is a spectrum of opinion. So I can appreciate that the UFO phenomenon might have, say, an inter-dimensional source that brings beings to our world that co-exist alongside us in a parallel plane of existence. However, although I might be open-minded about such a conclusion, that does not mean that I would necessarily accept the veracity of channelled messages allegedly received in telepathic communiqués from the denizens of Venus. So, what I hoped to read was some proof positive that information had been transmitted to Dr George King that later proved to be true. There was a small body of evidence for this, but not nearly enough to survive any statistical analysis. That said, I enjoyed reading large chunks of this book. Richard Lawrence builds his case well, and cites many interesting cases and rare facts about his subject. Of course, a fairly neutral coverage of the highlights of British Ufology is more often than not followed by his opinion about the source of the phenomenon. There is a bias in place that emphasises positive contact, and argues against more negative encounters - like abduction cases. Personally, I have some sympathy here, too. I believe that much of the historical UFO presence is related to humanoids very similar in appearance to ourselves - and for good reason, too. But that's not to say that abductions don't take place - and the author provides little evidence to support his controversial theory that abductions are deliberately created "by dark forces to cause confusion and negativity within the UFO movement" (p59). Based upon this theoretical construct, the author implores the reader to consider the importance of mystical revelation and contact with higher spiritual beings. Not only are there Ascended Masters available as spiritual guides, but there are also Cosmic Masters who provide a similar service, but from an entirely different location. Enter Dr King as their chief channeller. At this point, the book becomes quasi-religious in tone and content. I read it; I thought about it; but I concluded that his experiences are not based upon reality. Here's why: it would have been so easy in the 1950s for the Cosmic Masters on Venus to telepathically describe the surface of their own world. Twenty years later, that information would have been verified by human endeavour. As wise denizens of the solar system, the Cosmic Masters would have foreseen our scientific advance, particularly given that this very advance appears to be the reason for their intervention in the first place. So, where the Dogon described an unknown stellar companion for Sirius, in contrast, Dr King's channelled messages provide us with nothing concrete to verify later. Perhaps my doubts indicate that, in common with most folk, I am psychologically unprepared for true extraterrestrial contact. This is a measured and thoughtful book about a very strange subject. The author argues his case eloquently. I can see why the Aetherius Society still attracts members, all these years on. There is a profoundly important philosophy at work here, set on a cosmic scale. And its reliance upon mystical intuition reflects a general trend of our times. 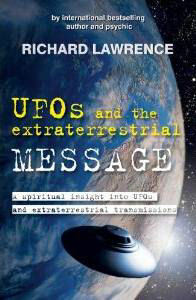 Subtitled "A Spiritual Insight into UFOs and Cosmic Transmissions"